La Valle, Wisconsin. Owned and operated by the Cook family, Carr Valley Cheese Company is over one-hundred years old. 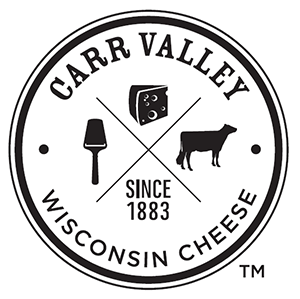 Carr Valley Cheese is one of America's finest specialty cheese plants. From traditional classics like expertly aged Cheddar Cheese to award-winning American Originals like Cocoa Cardona and Gran Canaria, their skilled cheesemakers turn milk delivered fresh from local dairy farms into more than 100 delicious cheese varieties. Today, fourth-generation owner Sid Cook is a Master Cheesemakers in the United States, one of a small handful of people with that title. It's a distinction awarded only to veteran Wisconsin craftsmen who complete a rigorous 15-year advanced training and education program. For more than 100 years, they've built our business on a unique blend of old-world craftsmanship and creative cheesemaking innovation. It's a combination you're going to love! Please check the shipping tab for important information about this product.